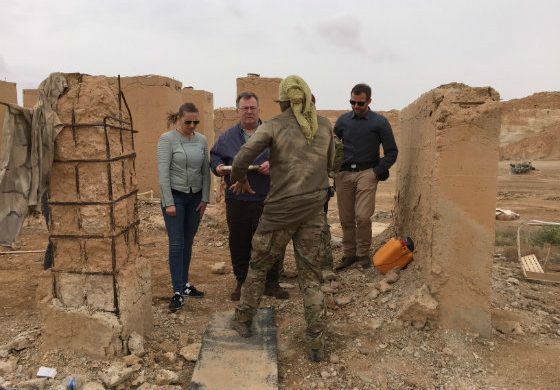 The defence minister, Claus Hjort Frederiksen, was in Iraq on Sunday to pay a visit to the Danish troops deployed in Iraq and taking part in the conflict against the jihadist organisation Islamic State (IS). The Coalition has enjoyed progress in the battle against IS – most recently in the fight to reclaim the city of Mosul. The eastern part of the city is once again in Iraqi hands, as are significant parts of the western side of the city. “As a minister and politician, it’s important to get out and experience the reality over here,” said Frederiksen. Currently, Denmark’s contribution to the Coalition consists of building up the capacity of the Iraqi security forces, the deployment of special forces and a mobile radar set-up. Until recently, fighter jets and transport aircraft had also been deployed. The capacity-building contribution is based out of Al Asad Airbase in western Iraq, while the special forces are also located. The Danish radar set-up assists with operations and the co-ordination of coalition aircraft in the region. Moreover, the Danish frigate Peter Willemoes upped anchor in January and headed to the Middle East to link up with the US-led Combined Maritime Forces (CMF). Also part of the Danish political delegation were three political party leaders: Mette Frederiksen (Socialdemokratiet), Kristian Thulesen Dahl (Dansk Folkeparti) and Morten Østergaard (Radikale).